There are many misconceptions surrounding teething in the community. Teething tends to be blamed for miserable children aged from 3 months to 3 years! Our lead dentist, Claire, decided to look into some of the issues surrounding teething when her daughter’s teeth started to come through at 7 months old. When do the baby teeth develop? 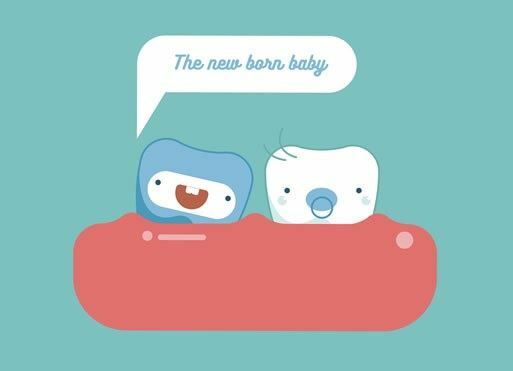 The 20 baby teeth (also known as milk, primary or deciduous teeth) begin their development very early in pregnancy, when a foetus is 5 weeks old. They are completed by the 14th week of pregnancy. The first baby teeth to come through are the two lower front teeth (central incisors), at around 4-8 months of age. However, when the teeth start to come through varies from child to child, although the order/sequence that the teeth come through doesn’t usually vary. Studies have found that symptoms related to teething occur over an 8-day period from before the tooth comes through to when the tooth has emerged through the gum. A third of children display no symptoms of teething prior to a tooth emerging through the gum. What is unlikely to be caused by teething? The first teeth come through at around the same time as passive immunity (as a result of maternal antibodies from the placenta) declines and exposure to a wide variety of childhood illnesses occurs. This most likely explains why so many aliments are attributed to teething by parents and the wider community. One study found that a number of infants who were reported to be ‘teething’ by a parent actually had a herpes simplex virus. Paracetamol is a painkiller (analgesic). It reduces the production of proteins called prostaglandins which are made by the body when inflammation is present. Paracetamol is also antipyretic, which means it is able to reduce the low level fever associated with teething. What treatments are not very helpful? Teething gels are very popular with parents. However, caution should be exercised when using topical gels in children as they could actually be harmful due to excessive application and swallowing. Teething gels containing choline salicylate (such as Bonjela and Ora-Sed) have been removed from sale in the UK and USA as the choline salicylate (found in aspirin) is associated with a condition in children called Reye’s syndrome. Bonjela and Ora-Sed sold in New Zealand still contain choline salicylate. Frequent application of these kind of teething gels can also cause a chemical burn. Teething gels may also contain local anaesthetics (numbing agents) such as lidocaine or benzocaine. A rare condition called methemoglobinemia can occur when benzocaine is ingested or absorbed through the mouth. Methemoglobinemia interferes with the blood’s ability to transport oxygen. In 2014, the US Food and Drug Administration (FDA) reviewed 22 cases of serious reactions to teething gels containing local anaesthetics. The FDA have since advised against local anaesthetic gels being used to treat infants and children with teething pain. The US Food and Drug Administration (FDA) notes that the risks of using teething jewellery include choking, strangulation, injury to the mouth, and infection. Choking may occur if the jewellery breaks and small beads or the whole piece of jewellery enter the child's throat or airway. There is also no peer-reviewed, scientific evidence base that proves amber beads release succinic acid (which is supposed to provide a painkilling action) as it would need to be heated to at least 200C or that the succinic acid could be absorbed through the mouth. However, biting on the beads will place pressure on the gums and decrease inflammation via the same action as teething rings. As a parent, it is difficult to see your little one experiencing any kind of pain and very natural to seek methods to reduce their discomfort. However, teething is a natural bodily process that we all go through and the actual symptoms of teething are very short-lived. TLC, paracetamol and teething rings are the only proven methods of helping your child. For further information, come and have a chat with us at the Dental Studio.